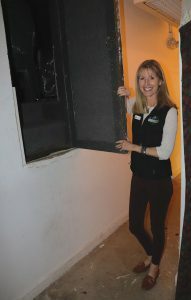 Jeanne Woods, who chairs the Liberty Theatre restoration project, reveals a subterranean passageway to the theater’s orchestra pit. As the lights came up, Novotny stood alone on the Liberty Theatre stage in North Bend. Dressed only in boxer shorts, he waited for another cast member’s entrance. He whistled to kill time. Finally, from somewhere beneath the stage, Novotny and the audience heard the director shout, “MOVE!” – followed by frantic stomping as the tardy actor pounded up the stairs. Subterranean dressing rooms and a creaky, narrow staircase are next on the renovation agenda for the troupe that owns the Liberty. Having delighted audiences by upgrading the playhouse’s auditorium, lobby and restrooms, Little Theatre on the Bay now aims to make life easier for its performers. LTOB has raised about $330,000 toward the $500,000 cost of the restoration’s Phase IV. That includes a $5,000 boost from the Coquille Tribal Community Fund. The grant is one of 49 that were awarded during the Tribe’s annual “Grant Week,” Feb. 23-March 1. The Liberty’s restoration has seven phases. The first phase restored the exterior. The second bought new seats and accessible restrooms. Phase III, now in progress, upgrades the lobby. After that, Phase IV will install a new air-flow system along with dressing rooms and a set construction area – all at stage level. Performers will welcome the change. Novotny described the current accommodations as “a little cold, a little dank.” Amateur thespians are used to making do, but he knows older performers who retired from the Liberty’s stage for fear of getting sick. The Liberty’s offstage area is a crazy quilt of improvised spaces. When a show needs a pit orchestra, the musicians must descend the stairs, then climb a stepladder and creep through a hatchway. During a backstage tour, Woods displayed what is jokingly called, “The Star’s Dressing Room.” It’s a triangular nook, maybe seven feet across at the wide end, furnished with a mop sink. Situated just offstage, it allows a quick costume change without a trip underground. LTOB needs to raise another $170,000 in the next year to finish Phase IV. Woods describes that goal as “totally doable,” thanks to rising community enthusiasm. Phase V will upgrade sound and lighting. Phase VI will add a children’s program space. The final phase will restore the original neon sign and Moorish domes. LTOB is selling “naming rights” for features such as seats, windows and inscribed tiles. Prices range from $250 on up to $250,000 to endow the stage itself. Woods hopes a corporate sponsor will grab that last item. “I need a sugar daddy,” she said. Prospective sugar daddies (and less ambitious donors) can learn more at http://thelibertytheatre.org. Little Theatre on the Bay was one of five arts organizations receiving Coquille Tribal grants in 2019. The otherswere the Clambake Music Festival ($3,000), Coos Art Museum ($3,500), Bandon Showcase ($1,500) and Jackson County’s Britt Festival ($2,000). Altogether, 49 organizations are received $261,720 during Grant Week, bringing the tribal fund to a total of $6.4 million since 2001. Mill Casino revenue pays for the fund. Jeanne Woods, who chairs the Liberty Theatre restoration project, reveals the subterranean passageway to the theater’s orchestra pit.